Do you prepare a monthly crime report? Good. Do you break down the number of incidents by crime type, for example assaults, break and enters, robberies, etc? Good. Once you have this month’s numbers, do you prepare a plus/minus over last month’s numbers, maybe with a splash of red or green to indicate direction? Pointless. I’ve seen too many crime reports, comp stat presentations, power point slides, what have you, that compare a current month’s crime (or week’s crime) to the prior month (or week). This is not a helpful exercise because crime has, as any large scale analysis of your incidents will indicate, an annual cycle. The number of crimes reported to the police has three distinctive cycles. 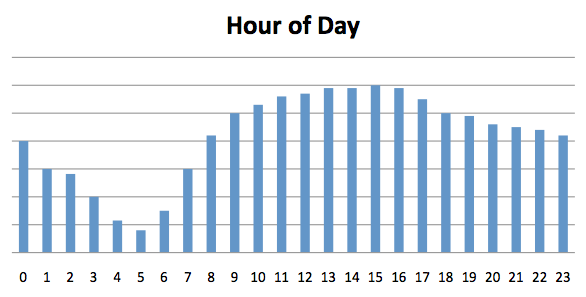 The first is daily, you get a different number of crimes being reported depending on the hour of the day. The second is weekly, depending on the day of the week, you’re going to get more calls. The third and final cycle is annual, you get more calls in the summer and fewer in the winter (in the northern hemisphere anyway). The following diagrams illustrate these cycles. 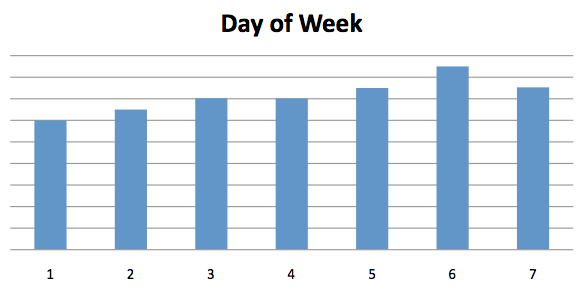 Now, I realize that day of week cycle doesn’t look like anything legitimate but keep in mind that the volume of incidents is high enough that the difference is statistically significant. I encourage you to perform an analysis on your own data to demonstrate to yourself that what I’m saying is true. Because crime has an annual cycle that means that if your crimes bottom out in January and peak in July then every month from January to July, on average, your current month’s stats are going to be higher than the previous month’s. 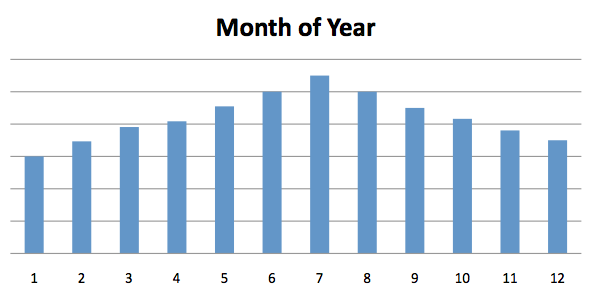 Similarly, after you reach the peak your current month stats are going to be less than the previous months. The problem, of course, is that when these stats are reviewed each month commanders are going to be chewing out underlings and developing strategies to counteract the perceived rise in incidents during the first half of the year and celebrating a job well done in the second half of the year. Of course, this is an exaggeration, cops know as well as anyone that they get busier in the summer than they do in the winter but to the untrained observer (the media, the public, etc) this kind of stat reporting is not helpful. The first is to compare this month to the same month from the previous year. This is a solid indicator since, barring drastic changes in the long-term trend (which you should quantify! ), the numbers should be viable for comparison. The number is viable because it compares two points that are on the same position in the annual crime cycle. The second alternative is to only compare a year-to-date (YTD) stat and forget the whole month-over-month nonsense. Like option one above, a YTD stat will provide you with a legitimate yardstick to compare one time period to another. The yardstick is legitimate because it takes into account the annual cycle by summing up everything since the beginning of the newest iteration. So there it is: don’t perform month-over-month stat comparisons. There are two equally easily calculated stats that will fill the spot in the report and provide actual insight. The key is to remember the natural crime cycles.